Blackhall Athletic eased through to the next round of the Victor Paris Bathrooms Cup with an impressive 2-1 win away to Dunbar United Colts. Nathan Gallagher returned to the squad and Andrew Jack was handed only his third start of the season. Jamie Campbell was given the captain’s armband for the game. Blackhall began the game looking dangerous, with Zane displaying some fancy footwork which won Blackhall a corner, of which nothing came of. Dunbar registered the first shot of the game when the ball was handed straight to number 18 Robbie Paulin, but the attacker couldn’t finish the chance, dragging the ball harmlessly wide. The home side began to pepper the goal with shots, and number 8 Rory Williams tried a pot shot from range, but Finn was happy to watch the attempt fly over the bar. Finn was then forced into the first save of the match when number 9 Kyle Jost hit a shot from outside the box, but the keeper was able to make an exquisite save to tip it over the bar. Blackhall continually showed extreme desire to win the ball, this was shown by Jamie Campbell who brilliantly chased down a midfielder, he sent the ball comfortably towards the Dunbar keeper, but Dugald wasn’t prepared to let the chance go. He sprinted after the ball and put his body on the line, before getting the ball smashed against him and watching it roll out of play. Dugald was again in the thick of things, as he found himself in a shooting opportunity, shifting the ball onto his right foot and fizzing his effort into the keeper’s arms. Blackhall were coming forward in waves, Zane miraculously kept the ball in play, then teed up Brandon who blasted a shot over. Zane won a free kick after turning his marker inside out and buying the foul. However, Dugald’s free kick was easily cleared by Dunbar. Blackhall really should have been in front when Brandon’s goal-bound shot was well saved by keeper Jamie Doolan, who then produced an astonishing reaction stop from Dugald’s follow up shot which seemed destined for goal. 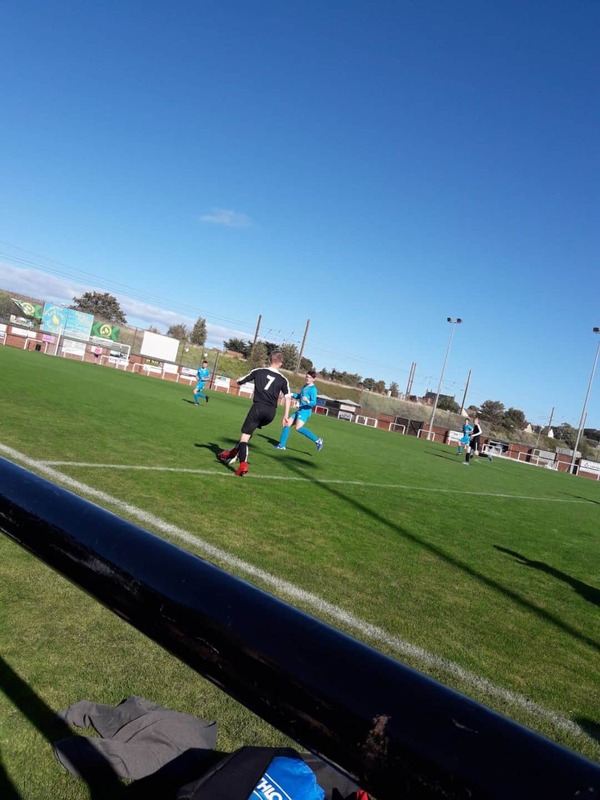 With Blackhall coming forward so often, the prospect of a counter attack was looming and Number 11 Branden Graham brought the ball forwards, knocked it past Andrew Jack and then released a venomous shot which zipped past the crossbar. Dunbar then worked Finn again, when he had to save a hopeful, long range, dipping shot which was luckily straight down the keeper’s throat. The home side launched a few long balls towards the box, but both Thomas Hedges and Thomas Palmer comfortably dealt with the aerial threat, clearing just about everything that came their way. Substitutions were then made by Blackhall, with Andrew Jack coming off for Nathan Pearse, Dugald coming off for Nathan Gallagher, and Craig coming on for Thomas Palmer which meant that Calvin Catala would slot in at centre back, and Craig coming into the midfield. Brandon then picked up a needless booking, so he was brought off for Fallilou to prevent the Blackhall number 20 from seeing red. Dunbar Number 10 Rory Cooper then almost produced a moment of individual magic, when he took the ball beyond two defenders, then thumped the ball wide of the mark. There was one last chance right at the dehath of the first half, when Fallilou layed off Zane, who missed the target with his shot. Subs were made at the beginning of the second half. Zane came off for Brandon, Dugald replaced Michael and Thomas Palmer replaced Thomas Hedges. Within seconds of coming on, Brandon displayed some sensational hold up play, allowing him to shift the ball to Nathan who played it to Euan Finlayson, his shot palmed away for a corner. From the corner Craig Stewart picked it up outside the box, glided past two players but was then tackled, and Dunbar counter attacked quickly. Robbie Paulin was through and one on one with Finn, who made yet another great save. The rebound fell back to Robbie but he put the second chance wide. Nathan Pearse was controlling the right side of the pitch from his right back position, and he sent the ball forward to Nathan Gallagher who took the ball to the wing, and delivered a powerful cross that was initially caught by the keeper, but the cross had too much on it and the goalkeeper dropped the ball into the back of the net to gift Blackhall a 1-0 lead. Blackhall doubled their lead just two minutes later when Euan picked up the ball from a Dunbar free kick, then raced down the channel from inside his own half, beating men for fun and finally slotting the ball into the bottom corner of the goal to make it 2-0 to the away side. 2-0 could so easily have become 3-0 when Brandon cut inside and shot, the keeper pushed it away from goal but straight into the feet of Fallilou, who’s shot from a tight angle was easily saved. Nathan Gallagher was then played in after a succulent pass from Jamie, Nathan took the ball to the wing and delivered a tantalising cross which the defender smashed right into his own keeper’s arms. More changes were made by Blackhall, Calvin came off after a solid display at centre back, being replaced by Thomas Palmer and Joseph Brodie was brought on for goalscorer Euan Finlayson. Brandon then missed a handful of good chances, cutting inside twice and watching the keeper make almost identical saves both times. The changes were rung once again, Zane was reintroduced, replacing Brandon, and Michael came on for Jamie Campbell who had run himself ragged. Dunbar had a rare sight of goal, when number 11 Branden’s audacious overhead kick sailed just wide. Dunbar came forward again and pulled one back after extreme miscommunication at the back between Finn and his defenders allowed an open goal for Branden to tap home and make it 2-1. Dunbar should have then been level when Kyle Jost broke free of the defence but somehow put his shot wide when it looked easier to score than miss, letting Blackhall off. Something had to be done to solidify the midfield, so Calvin came back on for Dugald, and swapped roles with Michael who now moved back to left back. Brandon then squandered another golden opportunity to put the game beyond Dunbar’s reach, when he cut in again and snapped a shot just off target. Zane then took on a couple players, leaving them behind before being well challenged, but the ball fell to Calvin who’s shot from range was blocked and put behind for a corner. Dunbar were then almost gifted an equaliser when Thomas Palmer sliced a clearance which was heading towards goal. Finn was able to head it but only helped it on its way to goal, but he unbelievably managed to chase back and get a hand on the ball to force it out. There was one last chance for Dunbar when number 14 Benjamin Knox was clean through, but the pressure got to him and he snatched at his effort, giving up the opportunity to take the game to extra time. Full Time. Dunbar 1 – 2 Blackhall.